2016 has been an interesting year of travel for me. 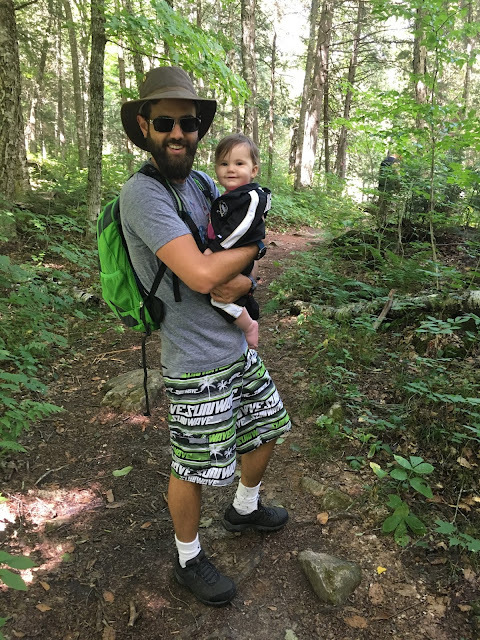 With the birth of my first child, Florence, at the tail end of 2015 we had to make several changes to our typical travel style to accommodate having our new bundle of joy in tow. In early June we had a fantastic week in a beautiful townhouse in Virginia Beach, along with my wife’s extended family. 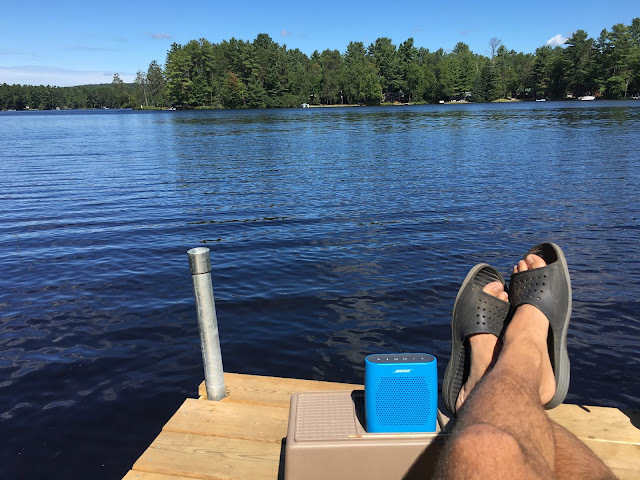 For our 2nd vacation with my family we chose a peaceful cottage setting deep in central Ontario cottage country, just on the cusp of the famed Algonquin Provincial Park. 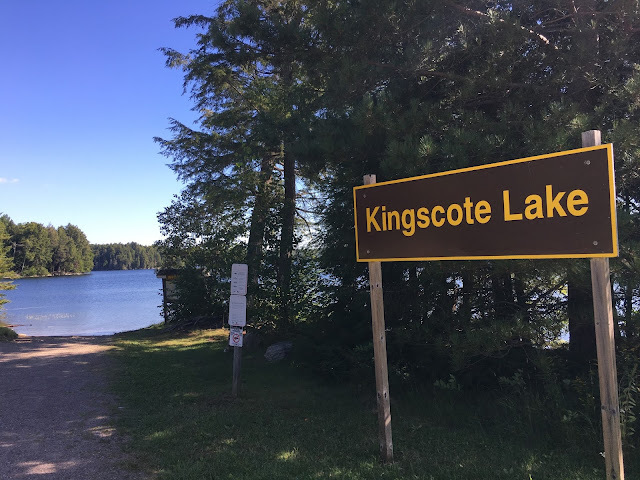 I had been to this cottage (40 minutes north-west of Bancroft), as well as Algonquin Park many times in the past, but never for anywhere near as long as the full-week vacation we planned this time around. The extra time allowed me to spread out many activities over the course of the week throughout the beautiful backcountry. 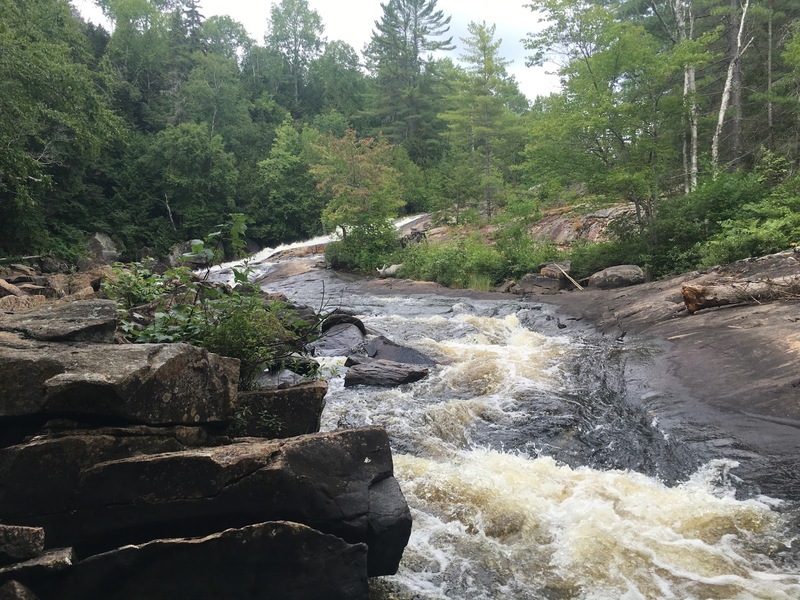 The cottage is located only a 5 min drive from the start of the Algonquin Park ‘High Falls’ hiking trail. The trail snakes through the forest on relatively flat terrain for about 1km before becoming quite steep and rocky over the next 500m or so. It eventually approaches some picturesque river rapids and ends with a great view of High Falls. The falls are photo-worthy for sure, but would never be confused with world famous Niagara Falls. We tried to bring Florence along in her quite rugged stroller (Bob Revolution SE), but once we got to the rocky portion there was no hope and she had to be carried the rest of the way, something I can’t really recommend for obvious reasons. 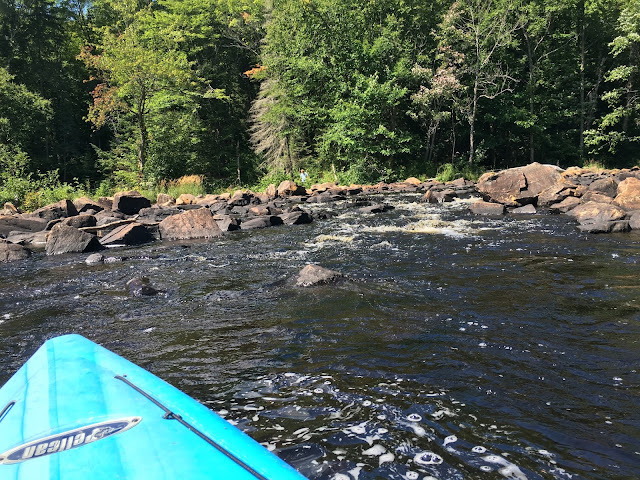 After you get to the falls opening, there are options to rock-hop along the riverbank and also some side trails back into the forest to keep you occupied. I set off one morning on a run that I had planned out ahead of time via Google Maps. From the cottage road I headed due north about 2km to Kingscote Road. This is a 7km long dirt road that eventually leads into Algonquin Park and an interior canoe access point on Kingscote Lake. 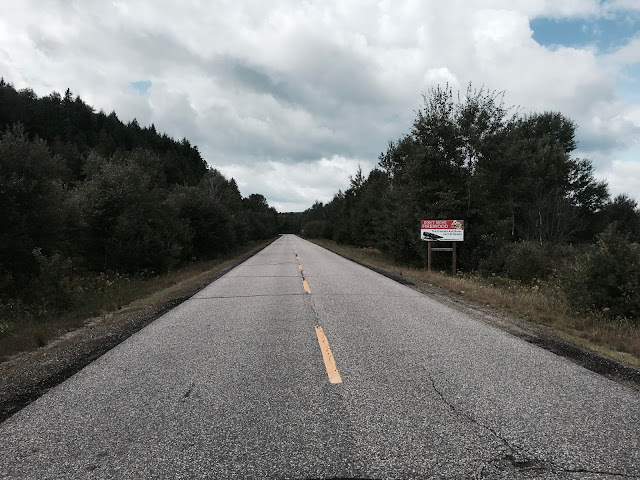 The 7k run across this road provided some great views of marshlands and was easily the most “backwoods” I have ever been, but runners beware: this is a logging route and massive logging trucks can rip around the corner at any time. I ran in the oncoming lane to avoid getting clipped from behind, unless there is poor visibility ahead where I moved to the right to avoid not being seen in time. The run was hilly and fairly grueling, but ended with a beautiful view of the pristine lake. In addition, I also ran some of the snowmobiling routes near the High Falls trail entrance, these were much less challenging and generally safer than the Kingscote segment. Our cottage was right on the shores of Benior Lake, so clearly some water sports were in good order. The provided kayak was great for exploring the lake. 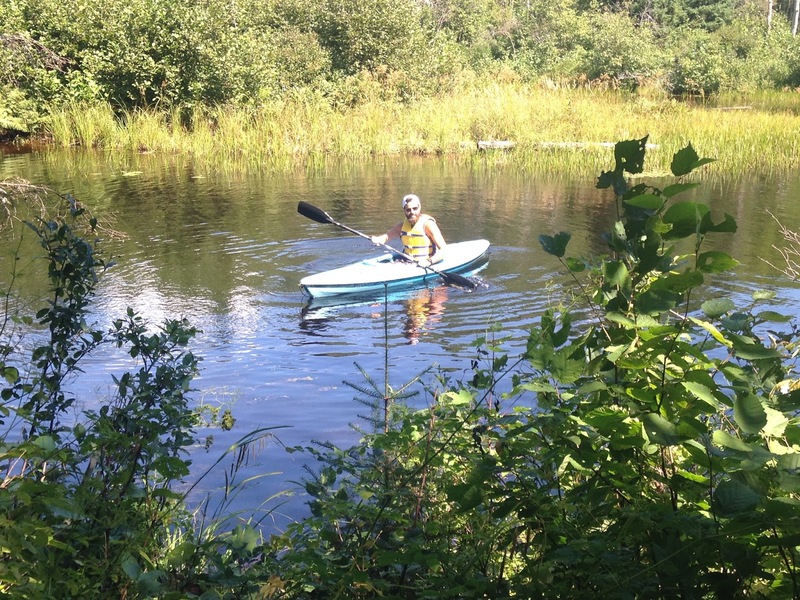 In addition to the cottage our family was staying at, we had two other family members that own cottages on the same lake, so the kayak became a great method of zipping around to pop in for lunch or just say hi. On our final full day I took up the challenge to paddle to the north end of Benior and exit the lake via a river leading into Algonquin Park and eventually the High Falls rapids. It was about a 5km one-way paddle of what can only be described as one of the most tranquil settings I’ve ever experienced. The gentle winding river traversed untouched wilderness before ending where the rapids began. 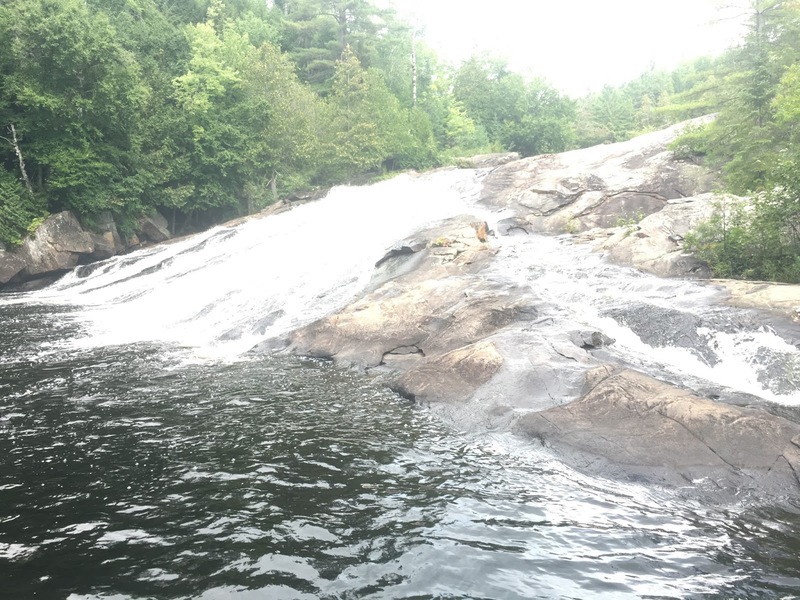 I settled into a small bay where High Falls hikers approach the rapids and as timing worked out, met up with my parents who were doing the hike at the time. The paddle back to the cottage was a challenge, however. When I re-entered the lake it was much choppier due to increased winds and the afternoon motorboat traffic. My recreational kayak held up quite well in the added chop though, and my tired arms were able to eventually power me back. Our cottage, while a tad rustic was perfect for our group. We had as many as 9 people staying in it and it never felt crowded. Being on a septic system for a full week was a new experience, but hey, it’s a cottage not the Four Seasons. As mentioned Benior Lake is great for water sports like kayaking, canoeing, jet skiing, tubing etc. 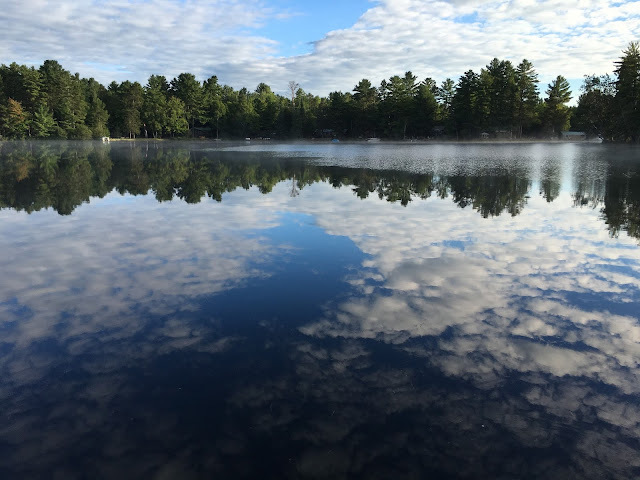 It is large enough to leave a lot to explore and to connect to other bodies, but small enough to easily get to friends and family staying at other parts of the lake. We had a shallow sandy beach which is perfect for small children, but the sand turns to mud and seaweed pretty quickly once you walk in. We did a bit of fishing but without much success. In the autumn my aunt and uncle have caught massive musky, but apparently the summer is a quiet time for the fish. 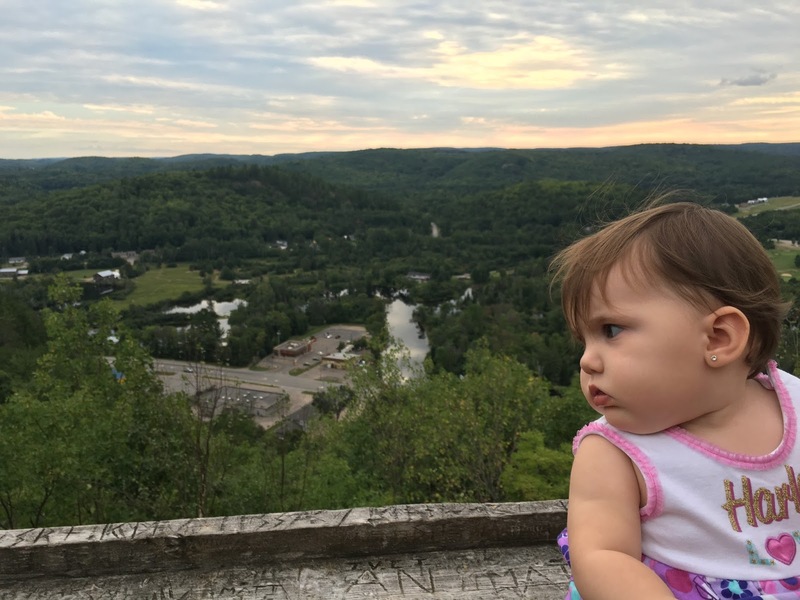 Florence was a bit too young to really partake in activities, but she had a great time hanging out with everyone and checking out the forest and lake scenery for the first time. As a cottage staple we had amazing bonfires each night and thanks to mostly clear skies the stars were just spectacular. After several days of cooking our own (abundantly carnivorous) meals, we decided to treat ourselves to a dinner out in Bancroft. About 40min from the cottage, Bancroft is the biggest town of substance in the area. It has all of the amenities a town should, a large grocery store, beer and liquor stores and a hardware store. It also has a quaint main drag with lots of little artsy shops. Unfortunately for us, the evening we arrived many of them were already closed for the day. For dinner we chose the Bancroft Eatery & Brew Pub which had some great eats and delicious local Ontario craft beef. After dinner we took a short drive up a steep road to the locally famous Bird's Nest lookout for a fantastic view of the town and surrounding forest. 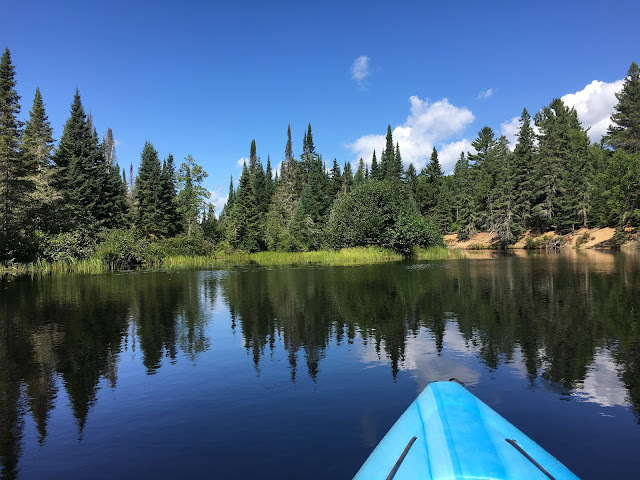 If you are considering a trip to Algonquin Park, check out my previous post. Want to know more about the cottage we booked? Check out their website here.